A police recruit from a rough Boston family is asked to go deep undercover to infiltrate the Irish mob. Meanwhile, another new officer uses his higher education to quickly rise in the ranks, becoming a mole for the Irish mob. When we hear a foreign film is getting remade in America, it's always a risky proposition. It is infrequent that American remakes come even remotely close in quality to their foreign counterparts, and it is even rarer that they surpass the originals. Leave it to the iconic Martin Scorsese to do just that with his Oscar-winning film "The Departed." Scorsese takes Hong Kong crime thriller "Infernal Affairs," which is a fantastic film in its own right, and brings that story and concept to Boston where he puts his own spin on it. The film stars a stellar cast led by Leonardo DiCaprio as undercover cop Billy Costigan, who attempting to infiltrate the Boston Irish mob, which is headed by Frank Costello, played by legendary actor Jack Nicholson. Costello is inspired by real-life Boston mobster Whitey Bulger. Also in the film is Matt Damon as Colin Sullivan, who grew up in South Boston and has been groomed since childhood to become a mole inside the police department working for Costello. Many people on the force are aware of the leaks, which is why they have taken it upon themselves to keep Costigan mostly off the record since the only people know he is working for them are his handlers Captain Queenan and staff sergeant Dignam, played by Martin Sheen and Mark Wahlberg. 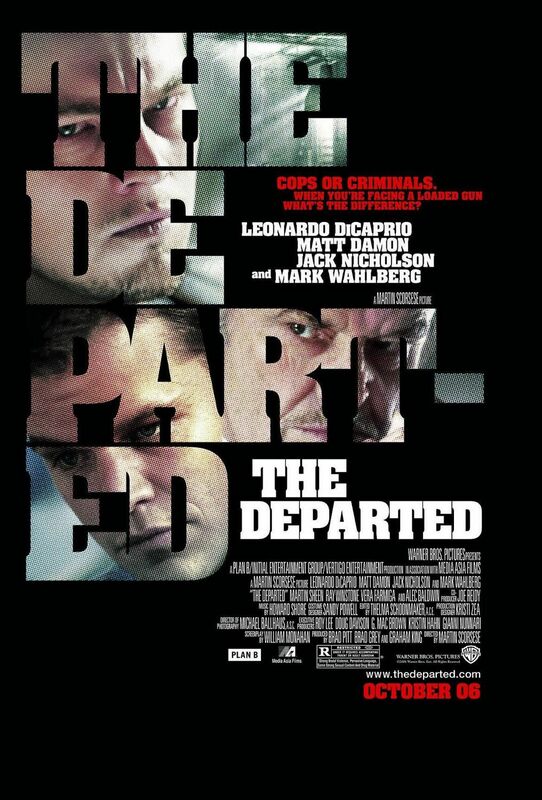 "The Departed" is a fantastically engaging and deeply engrossing thriller. It is brilliantly directed by Martin Scorsese, who is an absolute master of his craft. Scorsese took home the very deserved, long overdue best director Oscar for his efforts here. The film itself won four total Academy Awards including Best Picture. The acting is phenomenal across the board. Mark Wahlberg finally found a role that worked perfectly for his standard Boston tough guy shtick and was awarded a nomination for Best Supporting Actor. Even though he was the only actor nominated, Leonardo DiCaprio and Jack Nicholson are also stellar and very deserving of recognition. Nicholson managed to be simultaneously furiously intimidating, charming, even funny at times. Few actors have the on-screen gravitas Nicholson possesses, and it is both fun and scary to watch him in his element. As with almost all of Scorsese's movies, "The Departed" is quite long, but it doesn't matter to us because we remained engrossed and on the edge of our seats by every single second of it. This film showcases brilliant storytelling, directing, and acting at its finest.